Gentle Oil-Based Serum + Acne-Safe + Gentle + Anti-Inflammatory | Delicate Organic Maracuja Oil gently regenerates and brightens skin without the irritation typically associated with Vitamin C. Ideally balanced for all skin types, this nourishing elixir soaks into clean skin like a dream. Layer under your other products or wear alone. This smells lovely and clean while also being insanely beneficial. Address a host of skin concerns from old acne scars to textured skin while you sleep. Try mixing a few drops with Blue Moon Resurfacing Sleeping Beauty Balm. This is great for all skin types as a night serum. The current batch is very Tamanu-y, it smells a bit like molasses almost, but earthy. The scent fades, and some serums on the IG are just this one oil, but if it is strong for you, mix a few drops with any facial oil. Tamanu + Cannabis Sativa Seed Oil + Passion Fruit + Papaya + Guava + Prickly Pear + Manuka support skin with what it needs to repair and reduce inflammation and redness. ★Cold-pressed Oils + Essential Oils work together to gently soothe and regenerate the look of blemished and post-blemished skin. ★Helps address both pigment and texture issues. If your main concern is Post-Acne or Textured Scaring, this is the serum for you. It can be used along with any of my Misbehaving Face Serums + Scrubs + Toners during your PM routine. If you have severe breakouts, start with the Misbehaving Face Serum or Naked Misbehaving Face Serum AM + PM until your skin starts to clear. When it comes to my serums, you can really mix and match for just what you need. Some nights I use two drops of each of the above at night. This is perfect for use along the Misbehaving Face Serum or Naked Misbehaving Face Serum. To use together, use a few drops of each at night. I recommend using this at night because of the very high amount of naturally occurring Vitamin C.
❤Won't sting + burn + or dry your skin out. ❤Leaves skin feeling soft and supple. ❤ Wake up to smooth + glowing skin! Improved natural collagen production with Vitamin C + A. ◆Organic Hemp Seed Oil is light + nourishing + offers an ideal balance of Omega Fatty Acids for healthy skin regeneration + won’t clog pores + helps moisturize the deepest layers of your skin + reduces redness. ★Organic Maracuja Oil + Papaya Seed Oil is rich in Vitamin C and helps reduce scarring + discoloration + wrinkles + scars + spots + and leaves skin super soft. ★Organic Manuka Essential Oil (not to be confused with Manuka Honey) comes from a plant very similar to Tea Tree, but even more beneficial for Acne. It helps speed healing + reduce redness. 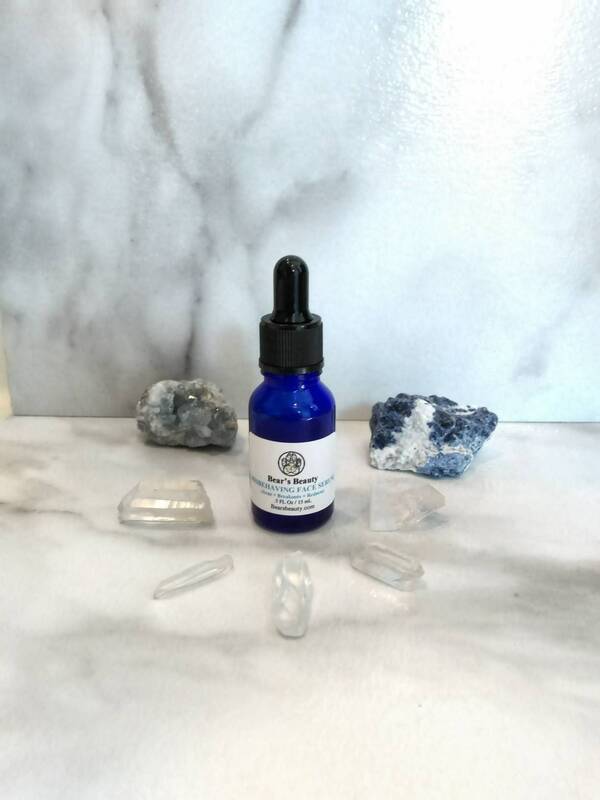 ★Organic Helichrysum is one of my favorite oils for regeneration and reduction of scars. It helps to make skin look better overall and reduces signs of aging. I use an Organic Helichrysum Essential Oil that is not only one of the finest available on the market, but is truly one of the most unique and beneficial essential oils I have found. It addresses concerns for all skin types. ◆Jasmine + Neroli + Turmeric + Sandalwood + Carrot Essential Oils help reduce scarring. ★Organic Rosehip Oil is packed with Vitamin A + E and not only encouraged collagen production, but never feels oily or greasy on your skin. It helps reduce spots + scars + wrinkles + and leaves skin dewy and soft. Apply 6 -10 drops to cleansed skin. I like to apply all my oil-based serums with wet hands or on a damp face. You can also spray a few sprays of hydrosol into palms and then drip serum into palm and mix together, then press into skin. The Hydro Emulsion Gel is another great water-based mix-in for serums and face oils. For a great co-part check out Misbehaving Face Serum. These two play very well together to reduce breakouts. Witch Hazel Toner and Oil Cleansing are also great options for acne-prone skin. All text, copy, pictures, graphics,product names, and formulations copyright © Bear’s Beauty 2012-2018 all rights reserved. All text, copy, pictures, graphics,product names, and formulations copyright Bear’s Beauty 2012-2017 all rights reserved.